Employment data for construction management positions indicate a regional growth rate of 169 percent from 2013-18 and a national growth rate of 11 percent from 2016-26, which equates to about 45,000 new jobs. The national average salary for a construction manager is $91,370. 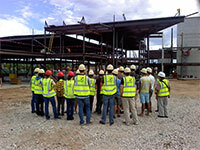 Find out more about Construction Management at the program home page.